PDF Postman™ Email Encryption Add-In for Microsoft Outlook: Converting Outlook Email Documents Into PDF files With The PDF Postman Add-on. PDF Postman is an add-on for Microsoft Outlook 2016 through 2007. It integrates tightly with the Outlook toolbar. Though generally used as a tool for encrypting email messages and attachments, PDF Postman another use. When you attach a document file to an Outlook email, you can choose to have PDF Postman convert it into an unencrypted PDF file. The PDF file is then attached to the email and sent to the recipient. The original document is removed from the email, and the PDF version of the file is attached to the email in it's place. You can accomplish the conversion of document attachments quite easily. Simply open a new email message, write your message and attach your documents to the email. The final step is to click the "PDF Files" button in the Outlook toolbar, and then send your message. The conversion will take place immediately, and the email will be sent with PDF file attached. Remember that using the "PDF Files" function will NOT password encrypt the PDF file; it only converts it into a standard PDF file. 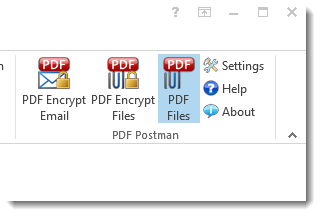 To encrypt the email message and the attached documents, use the "PDF Encrypt Email" function. You're welcome to download a free 15 day trial of PDF Postman. It works with both the 64-bit and 32-bit versions of Microsoft Outlook 2013 and 2013. The correct version will be installed automatically. Download our signed installer package directly from the PDF Postman website.